Build a Block Update Detector (BUD) switch. In the BUD, or Block Update Detector, when a block placed next to it is updated (which can happen by changing the state of the block in any way, such as cooking in a furnace, breaking the block, or placing the block), it sets off a redstone signal. The BUD can be used for any number of purposes such as on a tree farm, to determine whether a sapling has grown into a tree. Or, perhaps you want to identify when your sheep are eating grass next to the BUD. Or, you may want to identify when other players are mining on your property. The BUD works as the result of a minor glitch in the game: Its quasiconnectivity (partly connected) lets certain blocks be powered diagonally and even 1 block above the block, but activates only when a block update has happened next to the block. Two blocks that react to quasiconnectivity are pistons and dispensers. 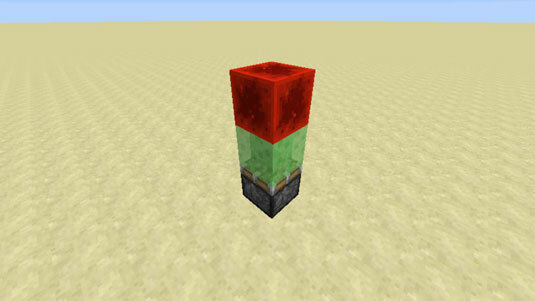 In the figure, you can see a sticky piston at the bottom, with a slime block on top of it, and a redstone block on top of that one, creating a BUD switch. Whenever a block is placed next to the sticky piston on the BUD switch, the sticky piston extends and then retracts quickly, triggering a redstone signal at the top that you can do other things with. Walk through walls with a double piston extender. A double piston extender uses 2 pistons to push an item in and out (commonly used to create virtual doors out of walls by moving the blocks in the wall in and out). Below the pistons is a layer of redstone dust on 3 blocks. Then the rest of the platform is built with redstone on the outer blocks and 2 repeaters in the middle. Place the repeater on the left and set it to 2 ticks, to refer to the repeater delay. To set the repeater to 2 clicks, right-click it once after placing it, and it changes from 1 to 2 ticks. Add a lever to activate the block next to the redstone. Add the block that you want to move (lapis, in this case) to the remaining piston closest to the wall. When the lever is turned on, the block is extended. When the lever is turned off, the block retracts. Now imagine this switch with multiple pistons on an entire wall! Double pistons are much harder to use vertically than horizontally. Create short pulses with a monostable circuit. A monostable circuit has one stable state (Off) and one unstable state (On). 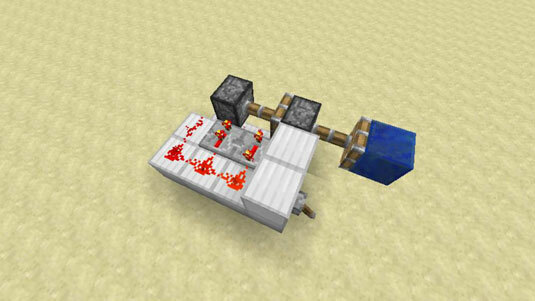 When the monostable circuit is powered, it emits one short redstone pulse before turning off. A few monostable circuits are used in items such as RS-NOR latches and T flip-flops. Start with a block with redstone dust on top. Put a sticky piston facing upward next to it. Place a block on top of the sticky piston. Place a block with a repeater on top of the set. The repeater is set to 1 tick by default, which is perfect in this contraption. Add a button to activate the system and a redstone lamp at the end as the output. 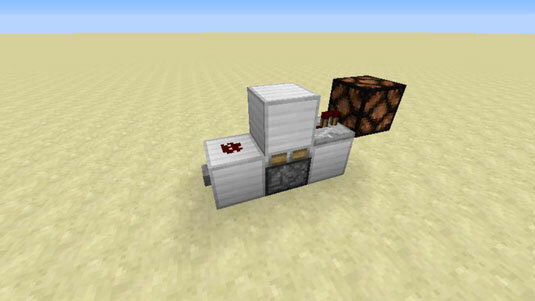 In this contraption, pushing the button briefly lights up the redstone lamp! 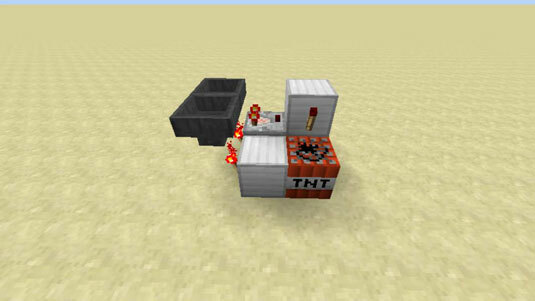 Blow things up with TNT contraptions. Place 2 hoppers in midair, facing each other (which connects them). Place 2 torches under the hoppers. Place a comparator next to one of the hoppers with the 2-torch side of the comparator touching the hopper. Place a block with a torch in front of the comparator. Place the TNT block as shown. Place any items into the hopper that’s connected to the comparator. Then break the torch under that hopper. The items begin filling the other hopper, working as a countdown clock. The more items, the longer the clock. When the last item empties from the hopper, the TNT explodes!